Background: The Service Provision Assessment (SPA) survey is a nationwide facility-based survey that measures the ability of health facilities to provide quality preventive, diagnostic, and treatment services for key maternal and child health and HIV/AIDS programs. Objective: The study was designed to assess some aspects of expressed maternal health services provided at ten primary health-care (PHC) centers in Babylon province, Iraq, using interviews with health service providers and clients and observations of provider–client consultations to obtain information on the capacity of facilities to provide quality services, and the existence of functioning systems to support quality services. Materials and Methods: A cross-sectional study was done in ten Babylon PHC centers from March to August 2018. The study included 165 pregnant women. The questionnaire included sociodemographic factors (age, residence, employment, parity, and education) and data related to Service Provision Assessment questionnaire which include a facility inventory, client exit interviews, and antenatal care (ANC) observation and consultation. Results: The mean age of pregnant women attending ANC was 25.29 ± 5.48, 66.1% came from urban areas, the majority were not employed (83%), their educational level was secondary (38.8%), and 57% were multipara. The findings showed that the majority (89.1%) of patients think that health facility services were good. A sizeable majority (83.0%) of women were satisfied regarding health services including availability of medicines at the facility (91.5%), cleanliness of the facility (100%), privacy (93.9%), charging or payment of fees for services received (0.6%), and discussion of problems related to the pregnancy (93.3%). Conclusion: This study showed a high level of satisfaction with the quality of maternal health services among antenatal attendees and highlighted the need to support interventions that increase the uptake of formal maternal health-care services. The Service Provision Assessment (SPA) survey is a nationwide facility-based survey that measures the ability of health facilities to provide quality preventive, diagnostic, and treatment services for key maternal and child health and HIV/AIDS programs. The SPA gathers majority of data on the availability of services; existence of critical equipment, supplies, and procedures (including management); provider capacity; performance and perceptions; and the client's perspectives on the services she received. The first SPA was conducted in 1997 in Guatemala. The survey was planned to gather majority of the data from a sample of all functioning health facilities in the country on the provision of health-care services and to analyze the readiness of facilities to deliver quality health services in child health, family planning, maternal and newborn care, HIV, sexually transmitted infections, noncommunicable diseases, and tuberculosis. Quality of care might have been accentuated at the international meeting organized by the World Health Organization in Almaty in 1998 to celebrate the 20 years of the Alma-Ata declaration. The vitality of quality of care in population programs emerged in the International Conference on Population and Development held in Cairo in 1994. Quality consists of the “degree to which health services for individuals and populations increase the likelihood of desired health outcomes that were consistent with current professional knowledge.” Technical excellence with which care was provided is the characteristic of interactions between provider and patient. The SPA questionnaire consists of a facility inventory which collects data on infrastructure, equipment, supplies and pharmaceuticals, guidelines and protocols, meeting minutes, registries, and other, as observed by the interviewer; clinical observation checklists which gather majority of the data on providers' performance and adherence to guidelines and protocols during direct client–provider interactions; health worker interviews which gather information on providers' offer of services, training, supervision, and perceptions on the working environment; and client exit interviews which are applied to clients at the point when they are leaving the facility, to get data on services received and their cost, accessibility to the services, and client perception of services. Improving the quality of care for maternal health is important if health consequences for mothers and babies continue to improve. This will need a renewed global focus. It is broadly recognized that the quality of care delivered for mothers and babies is rarely evidence based and woman centered. Uptake and coverage of care and quality of care are also linked. The commission identified ten recommendations to be adopted by countries. The first set of recommendations concentrated on better information for results, calling for countries to support vital registration and health information systems; to focus on a main set of harmonized maternal newborn and child health indicators; and to invest in information, communication, and technology to support their national health information systems at all levels. Countdown to 2015 reports recognized the need to observe the quality of care as well as coverage of interventions and the consistent need for better data to do this. These developments According to WHO 2015 are also recognized in the supportable development goals, with acknowledgment that getting such targets as reducing the maternal mortality ratio to under 70/100,000 live births by 2030, will need continued effort to increase the quality of care, supported by the availability of robust evidence. In response to the need for more and better data, the WHO was requested to suggest trace indicators for the quality of maternal and newborn health care delivered at health-care facility level that could be used for global comparisons. The aim of this study was to assess some aspects of expressed maternal health services provided at ten primary health-care (PHC) centers in Babylon province, Iraq, using interviews with health service providers and clients to obtain information on the capacity of facilities to provide quality services, and the existence of functioning systems to support quality services. This cross-sectional study was carried out in PHC centers in Babylon. It included 165 pregnant women from March 1 to August 1, 2018. A convenient sample of pregnant women in PHC centers attending antenatal care (ANC) was selected for the study. 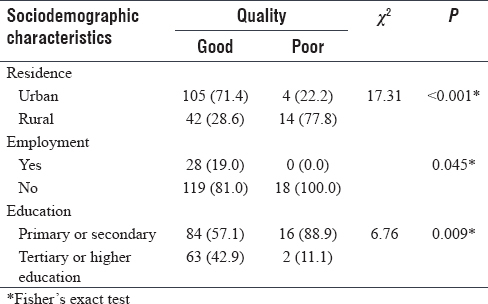 The prevalence of pregnant women attending ANC in PHC center was about 12%, so according to Fisher's formula, the sample size was calculated to be 165. 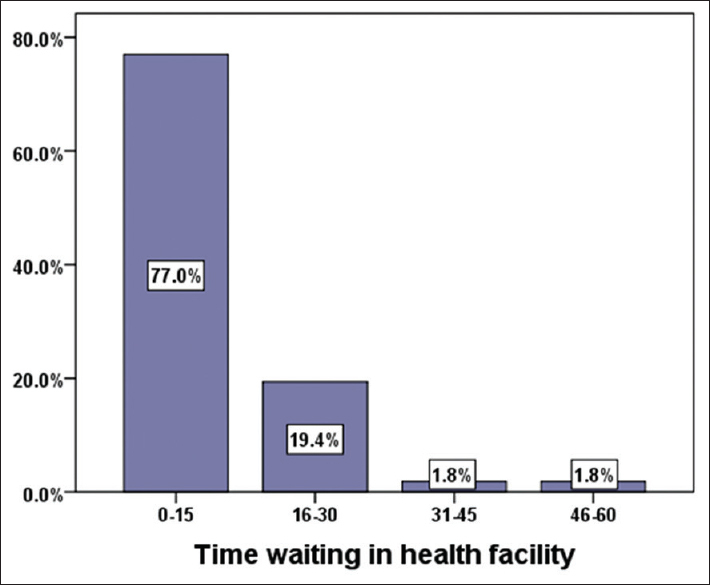 [Figure 1] shows the distribution of patients according to time of waiting in the health facility. Majority (77.0%) of the patients wait between 0 and 15 min, the mean time of waiting was 12.93 ± 10.20. Regarding the distribution of patients according to their opinion regarding the quality of health facility, majority (89.1%) of the patients think that health facility was good. While regarding the distribution of patients according to their satisfaction regarding health services, majority (83.0%) of them were satisfied regarding health services. 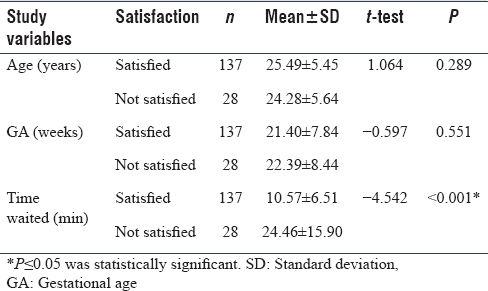 [Table 1] shows the association between satisfaction and sociodemographic characteristics including residence, employment, and education, with mean age (years) ± standard deviation (SD) of 25.29 ± 5.48. 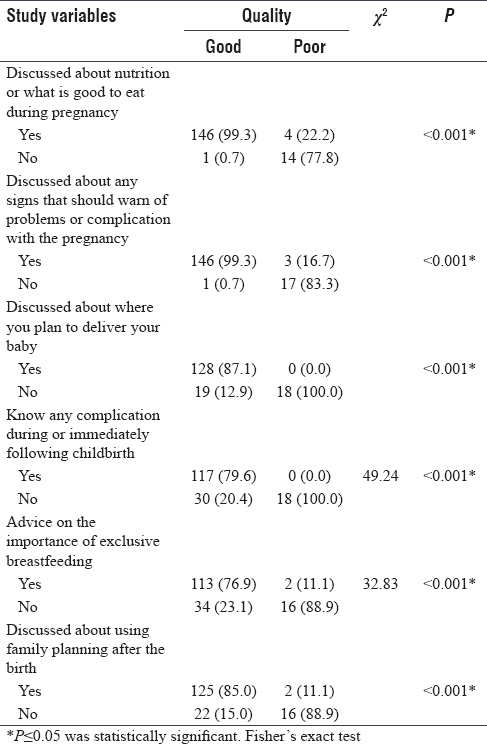 [Table 2] shows the mean differences of age, gestational age, and time of waiting to see the provider by satisfaction. [Table 3] shows the association between satisfaction and study variables including availability of medicines at the facility, privacy from having others hear your consultation discussion, were you charged or did you pay fees for any services you received, and “ability” to discuss problems or concerns about pregnancy. [Table 4] shows the association between the quality and sociodemographic characteristics including residence, employment, and education. 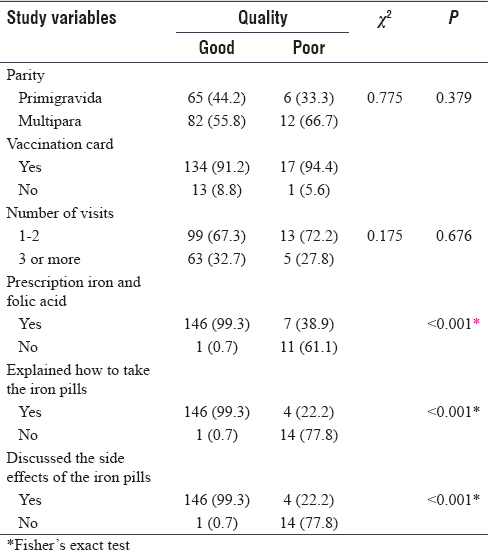 [Table 5] shows the association between quality and study variables including parity, vaccination card, number of visits, prescription of iron and folic acid, explaining how to take the iron pills, and discussing the side effects of the iron pills. [Table 6] shows the association between quality and study variables (client exit interview) including discussing about nutrition or what is good to eat during pregnancy, discussing about any signs that should warn of problems or complication with the pregnancy, discussing about where to deliver the baby, know any complication during or immediately following childbirth, advice on the importance of exclusively breastfeeding, and discussing about using family planning after the birth. This study systematically linked ten large-scale health facility assessment (SPA) surveys conducted in Babylon to assess the quality of maternal health in PHC centers, while the immediate aim of our study was to determine the likelihood of appropriate care for key ANC interventions in several PHC centers. Furthermore, this study underscores the need for an approach to improving the coverage of ANC interventions, namely, to improve ANC utilization and quality of ANC services. Health facility assessments, on the other hand, can provide insight on service availability and readiness at health facilities, but not on population-based coverage. Linking information about service provision or readiness to service utilization data offers great potential in identifying barriers to achieving high population coverage of intervention. Our analysis assumed that interventions were appropriately delivered promptly to yield the intended health gains. In this study, regarding client satisfaction, a sample consisting of 165 participants was interviewed in ten PHC centers in Babylon. Their sociodemographic characteristics were as follows: age ranged from 17 to 38 years, about 21.8% had primary education, 38.8% completed secondary/high school, and 18.2% had higher education. Similarly, in a study done in Basrah, Iraq, the age of the study population ranged between 14 and 45 years, about half of the study population (47.8%) were either illiterate or had not completed primary education, 24% attained education up to intermediate level, secondary education was attained by 14.8%, while higher education was attained by 13.5% of the pregnant women. A study done in Saudi Arabia found that the age range of the patients was from 18 to >55 years, with 25–35 years as the most frequent age group (36.9%), the education of about half of the patients (48.3%) was secondary/high school, and about one-third (34.2%) had achieved university degrees. Regarding employment status, 17% of the women were employed and 83% were unemployed, whereas in a study conducted in Basrah, Iraq, most of the pregnant women were homemakers (86.5%), followed by governmental employees who formed 13% of the study population, while only 0.5% were students. In this study, the analysis showed that the level of satisfaction in PHC was influenced by many of the factors, except for age that did not appear to be statistically significant with any of the main variables. In this study, residence was first in the rank to have an association with many of the dimensions of client satisfaction followed by level of education. There was a significant association between residence and client satisfaction (P = 0.001). Satisfaction was high (71.5%) in urban areas. Furthermore, there is a significant association between education and satisfaction (P = 0.05), the majority was primary or secondary education (56.2%). Similarly, in another study done in Saudi Arabia, a significant interaction between age and income (F = 2.89, P = 0.001) characterized the effects of sociodemographic factors on interpersonal dimension. Regarding waiting time in health facility and its association with client satisfaction, majority (77.0%) of the patients wait between 0 and 15 min, 19.4% wait between 16 and 30 min, 1.8% wait between 31 and 45 min, and 1.8% wait between 46 and 60 min. The mean of waiting time was 12.93 ± 10.20. There was a significant association between waiting time and client satisfaction (P ≤ 0.001). Similar to a study done in Basrah, Iraq, the waiting time was as follows: 33.75% of pregnant women spent 120 min, 11.25% of them spent 90 min, 12.5% spent 30 min, 27.75% spent 60 min, and 14.75% spent more than 120 min with a mean waiting time of 99.5 and SD of 5.220. Pregnant women waiting for 90 min express high frequency and high satisfaction rate followed by those waiting for 120 min. A study conducted in New Delhi found that the average waiting time reported was 30–35 min. The consultation time was approximately 5 min, while a study done in Malaysia for the assessment of patient waiting and consultation time in a primary health-care clinic showed that the majority of patients (91.93%) waited for <90 min in total to see the doctor. There have been various unpublished audits on waiting time conducted in primary care settings; however, the agreed and acceptable standards of practice were difficult to ascertain. The standard for this audit was defined according to the recommendation of the Malaysian Ministry of Health's patient charter, which stated that the waiting time for patients to be seen by the first provider in hospital outpatients and public health clinics should not exceed 30 min upon arrival with a standard of 80% target of achievement. It also stated that the dispensing of medication from the time the pharmacy received the patient's prescription should not exceed 30 min with a standard target of 95%. Furthermore, in the current study, regarding client satisfaction, there was an association between satisfaction and “availability of medicines at the facility, privacy from having others hear your consultation discussion,” “were you charged or did you pay fees for any services you received, and ability to discuss problems or concerns about pregnancy, and cleanliness of facility. In regard to the privacy from having other to hear consultation discussion about (93.9%), availability of medicines at the facility (91.5%), ability to discuss problems or concerns about pregnancy (93.3%), were you charged or did you fees for any services you received (0.6%), cleanliness of facility (100%), We found there is a significant association between satisfaction and availability of medicines at the facility (P ≤ 0.001), “privacy from having others hear your consultation discussion” (P ≤0.001), and “ability to discuss problems or concerns about pregnancy” (P ≤ 0.001). In comparable with a study was done in Basra province, supplements of the health center (50%), time spent with each woman (59%). Privacy (69.2%), and hygiene (62.8%), and medicine supply (70%). In this study, the overall satisfaction of health provision, Majority (83.0%) of were satisfied regarding health services. In agreement with a study was done in Basra's primary health care center, showed that (96%) of pregnant women were satisfied with the service that they had received. In this study, on analyzing the overall satisfaction of health provision, majority (83.0%) were satisfied regarding health services. In agreement with a study done in Basra's PHC center, the results showed that 96% of pregnant women were satisfied with the service that they had received, while in a study done in Turkey in 2004 regarding the level of satisfaction of pregnant women toward public health center, the result revealed that they were somewhat satisfied. Investigating women's satisfaction with ANC received at the PHC centers of Shirvan Chardaval, Iran, in 2005, it was reported that 89.8% of the women had very high or high satisfaction with the ANC schedule, whereas 10.2% of them had low or very low satisfaction. Compared to a study done in Egypt, high satisfaction (>90%) was reported regarding the following study variables: Waiting time for laboratory results, answering inquiries and help by staff, trust the doctor followed by cleanness of the center, privacy, most of accessibility items, and most of physician performance items, whereas satisfaction was (<30%) for location of the center, health education methods, and explanation of the problems by physician. Regarding the quality of maternal health in PHC centers, this study analyzed the quality of maternal health-care (MHC) services by using counseling on nutrition or what is good to eat during pregnancy (90.9%), discussing about any signs that should warn of problems or complication with the pregnancy (90.3%), discussing about where to deliver the baby (77.6%), know any complication during or immediately following childbirth (70.9%), advice on the importance of exclusive breastfeeding (69.7%), discussing about using family planning after the birth (77%), prescribing folic acid or iron pills (92.7%), and asking about vaccination card (91.5%). In the current study, majority (89.1%) of the patients think that health facility is good; only 10.9% think that health facility is poor. We found a significant association between the quality of services and sociodemographic characteristics including residence, employment, and education level; regarding residence, majority were in urban areas (71.4%, P ≤ 0.001); employment, majority were not employed (81%, P = 0.045); and educational level, majority had primary or secondary education (57.1%, P = 0.009). Furthermore, there was a significant association between the quality of services and discussing about nutrition or what is good to eat during pregnancy, discussing about any signs that should warn of problems or complication with the pregnancy, discussing about where to deliver the baby, know any complication during or immediately following childbirth, advice on the importance of exclusive breastfeeding, and discussing about using family planning after the birth, P ≤ 0.001. A study done in Egypt revealed that nutritional issues were discussed during the observed consultation with 38% of first-visit clients, While a study was done in Egypt, Nutritional issues were discussed during the observed consultation with (38%) of first-visit clients, While (29 %) of the interviewed clients said that they had been told about warning signs during the current visit or a past visit, talked about Exclusive breastfeeding (1%), and family planning (5%)”. In contrast to the study was done in Kamrup district, Assam, The service process activities observed for maternal health including screening and physical examination of antenatal clients, counselling on nutrition and rest; danger signs of pregnancy, on labor and delivery records were found to be satisfactory. However, there was no counselling on breastfeeding, reported in their study that the quality of antenatal services was poor at primary care level. Overall, the findings indicate the need to strengthen the quality of the work and to improve the coverage in a number of areas ranging from family planning and ANC. Our study showed a high level of satisfaction with the quality of maternal health services among antenatal attendees and highlighted the need to support interventions that increase the uptake of formal MHC services. Fort A. Tanzania Service Provision Assessment Survey. Calverton, MD: Macro International Inc.; 2006. Doullas BE, Omar A, Swai CW, Tanzania WY, Mshiu HE. Tanzania Service Provision Assessment Survey (2014-15 TSPA). Rockville, Maryland USA: ICF International; 2015. ICPD and the MDGs: Working as One Fifteen-Year Review of the Implementation of the ICPD PoA in Africa – ECA/ACGS/HSD/ICPD/RP/2009 ECA Addis Ababa; October, 2009. Amarjit S. Quality Assurance for RCH Services: Issues and Options. Department of Health and Family Welfare, Government of Gujarat; 2010.
van den Broek NR, Graham WJ. Quality of care for maternal and newborn health: The neglected agenda. BJOG 2009;116 Suppl 1:18-21. Bishai DM, Cohen R, Alfonso YN, Adam T, Kuruvilla S, Schweitzer J, et al. Factors contributing to maternal and child mortality reductions in 146 low- and middle-income countries between 1990 and 2010. PLoS One 2016;11:e0144908. World Health Organization. Accountability for Women's and Children's Health: The Commission's Recommendations. World Health Organization; 2011. World Health Organization. Countdown to 2015. A Decade of Tracking Progress for Maternal, Neonatal and Child Survival: The 2015 Report. Geneva: United Nations Children's Fund; 2015. Koblinsky M, Moyer CA, Calvert C, Campbell J, Campbell OM, Feigl AB, et al. Quality maternity care for every woman, everywhere: A call to action. Lancet 2016;388:2307-20. Baker U, Peterson S, Marchant T, Mbaruku G, Temu S, Manzi F, et al. Identifying implementation bottlenecks for maternal and newborn health interventions in rural districts of the United Republic of Tanzania. Bull World Health Organ 2015;93:380-9. Dhahi ZK, Issa SS, Hameed LA. A study on pregnants women's satisfaction with primary health care services in Basrs, IMPACT: International Journal of Research in Humanities, Arts and Literature (IMPACT: IJRHAL), University of Basra, College of Nursing; 2015;3:2347-4564. Alshammari F. Patient satisfaction in primary health care centers in Hail city, Saudi Arabia department of health administration, university of Hail, Hail, Saudi Arabia. Am J Appl Sci 2014;11:1234-40. Patro BK, Kumar R, Goswami A, Nongkynrih B, Pandav CS; UG Study Group. Community perception and client satisfaction about the primary health care services in an urban resettlement colony of New Delhi. Indian J Community Med 2008;33:250-4. Ahmad BA, Khairatul K, Farnaza A. An assessment of patient waiting and consultation time in a primary healthcare clinic. Malays Fam Physician 2017;12:14-21. Erci B, Ivanov L. The relationship between women's satisfaction with prenatal care service and the characteristics of the pregnant women and the service. Eur J Contracept Reprod Health Care 2004;9:16-28. Kajuri MD, Karimi S, Shekarabi R, Hosseini F. Investigating women's satisfaction with prenatal care received at the primary health care centers of Shirvan Chardaval, Iran. The Internet Journal of Gynecology and Obstetrics; 2005;7:2-6. Montasser NA, Helal RM, Megahed WM, Amin SK, Saad AM, Ibrahim TR, et al. Egyptian Women's Satisfaction and Perception of Antenatal Care, International Journal of Tropical Disease & Health, Department of Community Medicine, College of Medicine, Mansoura University, Ministry of Health and Population; 2010;2:2278-1005. El-Din AT. Egypt Service Provision Assessment Survey. Ministry of Health and Population Cairo, Egypt El-Zanaty Associates Cairo, Egypt ORC Macro Calverton, Maryland, USA; 2004. Rabha AP. Assessment of quality maternal health care services at primary health care level in Kamrup district, Assam, Department of Community Medicine, Assam Medical College, Dibrugarh, Assam; 2017.